was studied and interpreted by Jonathan Elias of the Akhmim Mummy Studies Consortium. 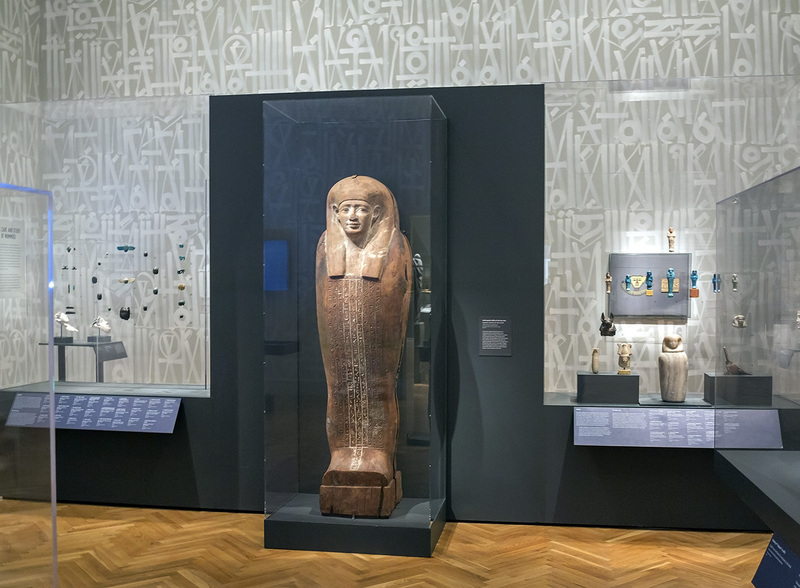 The exhibit reveals information that has been gleaned about Irethorrou’s lifestyle, the society in which he lived, his religion, and the funerary beliefs of his time. 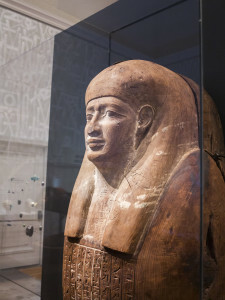 The second mummy and her coffin have not fared as well and present a stark contrast to Irethorrou’s perfectly preserved body. 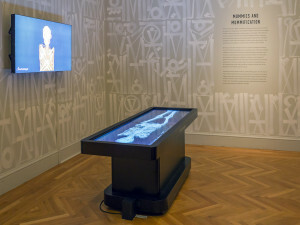 In high-tech contrast to these ancient Egyptian practices, visitors can examine both mummies by means of an interactive “virtual dissection table.” A fascinating group of amulets and tomb furnishings is also on view. 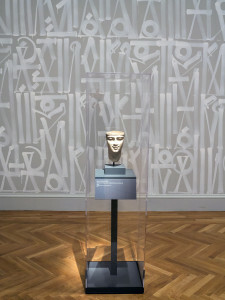 In a brilliant move, the museum commissioned Los Angeles-based artist RETNA to cover the gallery walls with his signature painted calligraphic shapes, based on Egyptian as well as Arabic, Hebrew, runic and other sources. The ghostly white writing enrgizes the space and evokes a sense of mystery akin to what the ancients must have felt in the presence of hieroglyphics (meaning “sacred writing”) Originally a graffiti artist, RETNA (born Marquis Duriel Lewis, in 1979) has built a formidable reputation as a studio painter and public artist; appropriately enough, his stage designs grace the current San Francisco Opera’s current production of Veridi’s Aida. 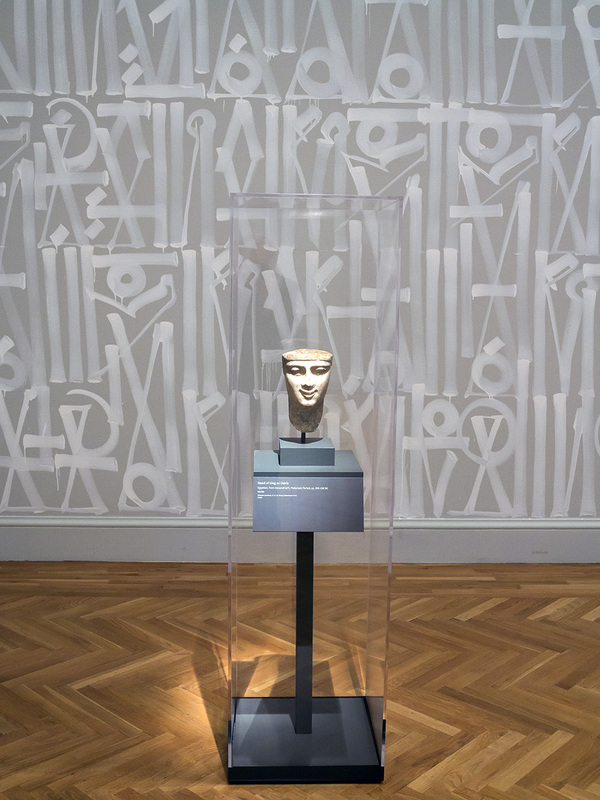 Renee Dreyfus, Fine Arts Museums of San Francisco’s Curator of Ancient Art, explains: “The history of graffiti goes back far into the reaches of antiquity….When I look at RETNA’s words I get the same sense of power that I get when I look at hieroglyphics. 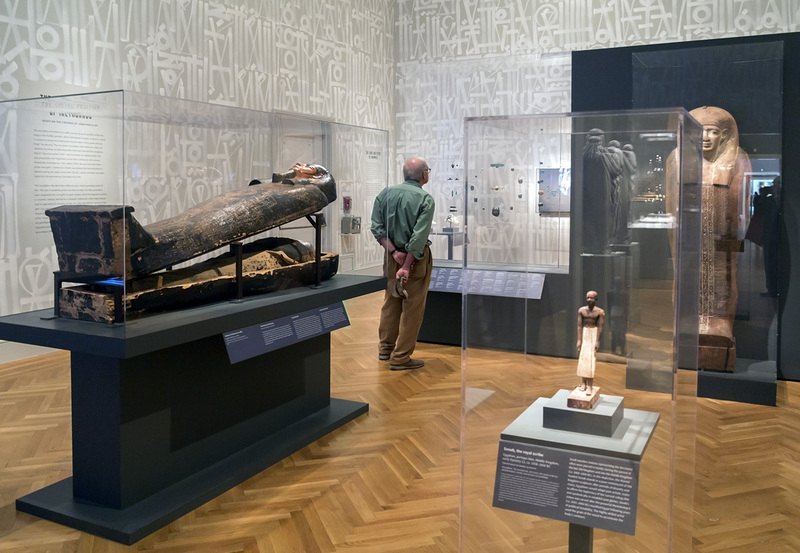 He has managed to create the same feeling that I get when I walk into an Egyptian tomb.” While the interpretive panels in the exhibit are excellent, the sense of unfathomable mystery remains. This entry was posted in Hedgehog Highlights and tagged Akhmim Mummy Studies Consortium, Curator of Ancient Art, FAMSF, Fine Arts Museums San Francisco, graffiti, Hatason, Irethorrou, Jonathan Clark, Jonathan Elias, Kerstin Muller, Legion of Honor Museum, Rebecca Fahig, Renee Dreyfus, RETNA, San Francisco Opera Aida, Stanford University Medical School Dept. of Radiology, The Future of the Past: Mummies and Medicine, virtual dissection table on November 17, 2016 by Leslie.